William Scully Ltd. will manage your custom headwear development in house, from the design stage right through the manufacturing process. We believe that the development of quality custom products requires a long history of manufacturing, access to the very best materials, and constructive consultation with the customer. Our finished goods and services have helped to distinguish Canada's early Militia and the North-West Mounted Police and today's Canadian Forces and the RCMP. For five generations, the Scully family has enjoyed a reputation for quality and innovation. 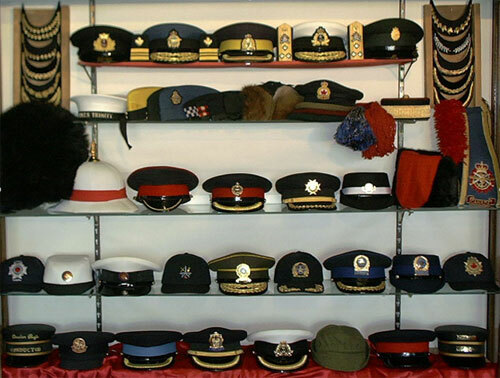 Scully products are icons of Canadian Military Service and Ceremonial Dress. All of our headwear products are custom and made to measure. We have a wide selection of materials and expertise to aid in the recreation of an historic military item or the development of something new. Our design department is at your service. Please contact us for a free estimate, furnishing us with your maximum quantity, and uniform headwear design detail.